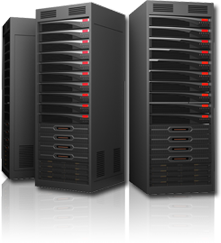 One of the secrets to the success of our carefully-crafted websites is our reliable hosting service. We don't just design and build websites and send them out to fend for themselves. When they're built and tested and offered up to the world, we take care of them and nurture them every day with local, timely and unmatched customer service. They're hosted on fast state-of-the-art Microsoft Windows Servers, monitored 24/7 for any unusual activity and benchmarked continuously for performance. Though it's more expensive to own and update, staying true to this technology and concept has allowed us to offer web hosting that consistently outperforms our competitors - in reliability, speed and economy. We only host sites we develop and maintain, so you don't sacrifice personal service while we take care of hundreds of sites sharing our bandwidth. We also handle domain registration, renewals and management as part of our service. Our web servers are located in a sophisticated state-of-the-art secure data center with multiple connections to both the power company and major telecom providers. Backup battery power supplies and emergency generators ensure our industry-leading 99.9 percent uptime. Our skilled server administrators keep a close eye on every site and are on call 24/7 to assure your satisfaction. We don't limit the number of email accounts you need for your business. We will be happy to set up as many accounts as needed to accommodate your staff. These are dedicated email accounts, at your own web address, which can be checked using a viraity of email clients such as Outlook, GMail, Thunderbird, Apple Mail to name a few. For those times you are away from your desk or home, we provide an easy-to-use web interface in almost any web browser. Check your mail anytime, anywhere using our mail software SmarterMail's Mobile Web Interface.